I have been a lot of food trails and made some interesting discoveries. You never know what's waiting out there till you actually head out and place an order. So little surprise that I jumped at the opportunity of a food trail inside the Kempegowda International Airport (BIA) or BIAL as we commonly call it. The F&B team has gone to great lengths to understand the needs of passengers flying various sectors and cater to their food requirements - and so have everything - from a quick breakfast on the go, to a more elaborate meal that you can sit down, much like you would at a high-end restaurant in the city. If its pick and board that you like then there you have. Or if you would rather sit back with a drink, and gaze on to the runway watch and planes take off, land and taxi to a halt, well you have the chance to do that too. Bar 380 degrees makes you stop and think for a second - isn't it supposed to be 360 degrees... well yes, say the powers that be at BIAL, but we have taken poetic license (if you may) with the name. The bar is placed right where the aero-bridge for the Airbus 380 is going to be when it finally makes Bangalore its home. In fact when it taxis up, its nose will be right up front for the diners at 380 degrees. The pub is spread across a significant length of the terminal, with a wonderful view of the runway. I sat mesmerized in the day time watching the flights taking off, I can only imagine how beautiful it must be at night. In fact, if you choose your seating wisely, you will also have a brilliant view of Nandi Hills. Bar 380 degrees offers a good sized drinks menu, which is quirkily designed as your passport is. A good range of Indian and international brands of wines, whiskys, vodkas, brandys, gins and more are available. Once you place your order, take a look at the decor around. The little coasters you see on the table will tell you exactly how far a particular international destination is from where you are seated. This has been done for all international destinations that the BIAL caters to. It being a working day, a long one at that, everyone naturally stuck to the fresh fruit juices that were also available. We placed ourselves in the hands of Executive Chef - India region, Murali Murthy G. Two sampler platters of the fare at Bar 380 degrees was brought out for us - one a vegetarian and the other a non-vegetarian one. What you see above is the non-vegetarian platter - the fish of the fish 'n' chips dish, BIAL style french fries, a coleslaw and bruschetta. The fish had a pleasant, crunchy exterior and soft fish on the inside, the grease was almost non-existent. The tartare sauce it was served with made a nice accompaniment. The BIAL style french fries was a served with a tadka of curry leaves and Indian spices - a tad generous with the salt, but then french fries are always a crowd pleaser. The bruschetta did not really work for me for perhaps the lack of olive oil and garlic and that the tomatoes were too raw for my liking. The vegetarians had the same platter with the exception of onion rings being served. These rings were delicious, made more so by the fact that they are hand cut and not the processed ready-to-fry variety. It was now time for stop number two - we didn't eat here because we were constantly reminded of the massive feast that awaited us at Malgudi Tiffin Center, which our last stop in the domestic terminal. So the Urban Food Market is strategically placed in the budget airline section of the international terminal. The food is fresh, in an impressive range and you can be sure there is something for everyone. From salads, sandwiches to cakes, pastries and freshly made pizzas in the evenings, Urban Market fare may be had in the terminal or may be taken along on the flight. We were told that many a times, odd flight timings result in people not wanting to eat at the terminal or en route, but rather take something for when they reach their destination to save themselves the hassle of cooking or heading out for a meal. Fruit or vegetable salads, packaged drinks and even fresh ones that are constantly being replenished from the kitchens catering to the Noodle Bar and 7 Tawas right across the terminal. 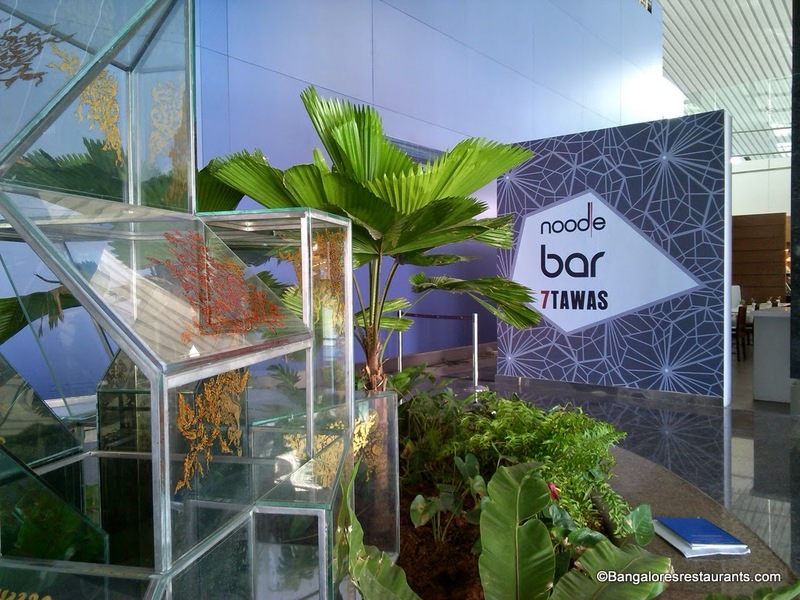 Noodle and 7 Tawas is a long food court like set-up to cater to every member of the family - from Oriental fare, some of which is tossed up live in the evenings, to classic Indian fare on the 7 tawas that the kitchen has going... you have an interesting range to chose from. Over the counters are TV screens that tell you just what is being cooked on each tawa. Take your pick, get your food, sit down and enjoy. Here too the food is designed to suit the hunger pangs of a person in a snacky mood, a comfort eating mood and even a ravenously hungry mood. We were not about to be let past this area without sampling something and so started off with a spiced buttermilk, which was refreshing, but again a little heavy handed on the salt for me. There were vegetarian and chicken steamed momos that were really nice and which came with an accompaniment of a sweet and hot chilli sauce. Vegetarians were given a paneer kaati roll and the us the chicken roll or the Murgh Kurchan kaati roll. These were just half servings but packed quite a bit in it. The whole roll will be quite substantial. A small portion of the ragda samosa chaat from the menu was also served - the uniqueness of which was that the dish had no onions or tomatoes. While I did not miss tomatoes in a chaat, I certainly did miss the onions. This brought us to the end of the International terminal part of the trail. But not before we checked out the cool O2 spa, the Premium Lounge and the waiting areas complete with laptop and mobile chargers at every table and under every chair. As we exited the international terminal, with another longing look at the duty-free we headed straight to Malgudi Tiffin Center in the domestic terminal. We began with a Nannari sherbet (L) and the pepper rasam (R). The Nannari sherbet was a first for me - a root popular in Kerala that is converted into a fizzy drink. The rasam absolutely hit the spot. Though there are several dishes you can order from the menu, including set thalis, Chef decided to put together a thali that would showcase the offerings of the restaurant. So what you see here may not be what you finally get in your thali. Care is taken to rotate dishes served in a thali, so that a guest is not likely to eat the same thing, if he finds his way through the same terminal for a meal again. The thali is large and so are the portions, so overeating is a given with these thalis. This is the vegetarian one and starting from the left, you see a Tori Ambat - potato and pigeon in a typically south Indian coconut and tamarind based preparation. Next is the Ennai Kathirikai - baby brinjals slit down the side and braised with spices and tomatoes. We skip one, as am not too sure what that was and head to the Sorakaya Majiga Charu or Bottle gourd in a spiced buttermilk curry and finally the Tarkari Gassi, a Mangalorean mixed vegetables coconut gravy. The non-vegetarians had the (L to R) Mangalorean Fish Curry - a coconut gravy with seer fish. The Mutton Varutharacha Curry - a mutton in coconut gravy, a helping of the Tarkari Gassi, the Gongoora Kodi - Chicken in Sorrel Leaves and the Ennai Kathirikai. All of the dishes served were generous with the coconut and so naturally the taste was great. One thing is for sure, that you are not going to feel like you are eating mass-churned-out food at an airport kiosk. There is a distinct homely touch to everything. But being a Mangalorean myself, I would have preferred if both the Tarkari gassi and the fish curry did not have such dense gravies. The dishes were served with parathas, neer dosa, idiappams, kalappams and sannas.